Driving up next to an 18-wheeler on a busy stretch of highway is not necessarily for the faint of heart. Big rigs have a tendency to move suddenly between lanes, and tractor-trailer drivers have a more limited field of vision than you do in your sedan, SUV, or minivan. However, sharing the road with these titans of the highway need not be a fearsome experience. You simply must be aware of the potential perils involved, and make appropriate adjustments to safely accommodate both of you on the road. Truck drivers themselves are supposed to be trained professionals with the knowledge and experience to handle their rigs properly. 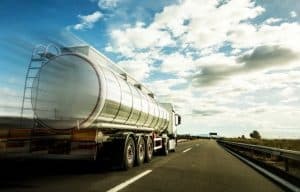 Sometimes, it is the limitations of the trailer itself that introduces the potential peril of a truck accident affecting both the trucker and other drivers. Large trucks have larger blind spots, sometimes called “no-zones.” These are areas around the tractor-trailer in which the truck driver cannot see your vehicle. The likelihood of an accident occurring between you and the trucker increases when your vehicle is positioned within a trucker’s blind spot. According to the Federal Motor Carrier Safety Administration (FMCSA), the Large Truck Crash Causation Study (LTCCS) reported that 14 percent of crashes involving large trucks occur due to the commercial motor vehicle (CMV) drivers’ inadequate surveillance. This means the trucker either failed to look in the right place or could not see the traffic when looking for it. A helpful piece of information to keep in mind is that if you are unable to see the truck driver’s face in the truck’s side mirror, the trucker most likely cannot see you as well. As the largest type of motor vehicle on the road (in most cases), an 18-wheeler possesses a distinct weight advantage over every other smaller car traveling beside it. A small sedan is no match for an 80,000 pound tractor-trailer in a collision. Always keep this in mind as you share the highway with big rigs. The laws of physics will ensure your vehicle suffers the bulk of the damage as opposed to the semi. Due to the heavy weight of large tractor trailers, they can often take significantly longer to come to a stop than other smaller vehicles. Drivers who dart and weave behind, alongside, and in front of big rigs are not necessarily acting wisely when they fail to keep in mind that a fully-loaded truck at highway speeds can take nearly the length of full football fields to stop – much longer than a standard road sedan. As of now, early 2018, large tractor trailers are not mandated to have side underride guards installed, the potential for fatal underride crashes still exists. Many big rigs do have rear underride guards installed which protect vehicles slamming into the back of trailers. An override collision can occur when a big rig crashes into the rear end of a passenger car. Both underride and override scenarios can be deadly to the occupants of the car. According to IIHS, in 2016, 66 percent of fatalities involving large truck accidents were the occupants of the car. Trucking accidents can result in catastrophic results, including severe injuries and death. Determining legal liability in such cases can be painstakingly arduous and complicated. For this reason, it’s important to have the representation of an experienced attorney who knows how to fight intelligently on your behalf. At Harris Lowry Manton, LLP, our Georgia truck accident attorneys work vigorously to secure high-value compensations for our clients. To set up a free consultation, complete our contact form, or call us in Atlanta at 404-998-8847, or in Savannah at 912-417-3774.